Home » Europe in the time of Charles the Great 768 – 814. 1. THE central feature of this map-the extension of the Frankish power over Saxony and the Wendish and Avar territories eastward, over the greater part of Italy, and over the strip of land beyond the Pyrenees known as the Spanish March-is more fully shown in the map of the Frankish dominions in Carolingian times (Plate XXXIII). It was the conquest of Saxony which carried the Frankish frontier up to the regions occupied by the Wends, and involved almost of necessity a further advance, if not of conquest, at least of influence; but the authority which the king of the Franks was able to exert over the Abodrites, Wilzians, Sorbs, and Bohemians was limited to occasional acknowledgements of his superiority and to the irregular payment of tribute. No attempt was made until the tenth century to bring these tribes under the administrative system of the kingdom. Italy, with the overthrow of the Lombard kingdom in 774, fell into two broadly distinguished divisions. The northern part, with the exception of Venetia, which still held to the Emperor at Constantinople, formed the kingdom of Italy. Its southern limits, roughly speaking, included what we now know as the Campagna and the Abruzzi. Beyond these lay the Lombard principalities of Benevento and Salerno, and what remained of the possessions of the East Roman (or Byzantine) Empire, namely the eastern and southern extremities of the peninsula, the lands of Naples, Amalfi, and Gaetà, and the great islands of Sicily and Sardinia. It will be noticed that, with whatever changes in detail, the broad fact of the division of Italy into two entirely separate countries subsisted from the time of CHARLES THE GREAT until the erection of the new Italian kingdom in 1861; and the boundary line remained substantially unaltered, except that the Abruzzi passed from the northern to the southern half in 1140, and thenceforward belonged to the successive kingdoms of Sicily, of Naples, and of the Two Sicilies. The Spanish March is of interest as the nucleus from which the Christian kingdom of Navarre, county of Barcelona, and kingdom of Aragon gradually emerged. Westward of it were the little kingdoms of Asturia and Cantabria, which were united in 751, and which grew into the kingdoms of Leon (916) and Castile. But all the land south of the Douro was subject to the emir of Cordova, and, so long as the Omayad dynasty lasted, the Christians were hardly at all able to enlarge their borders at its expense. 2. The dominion of the Byzantine Empire, cut short, as has been mentioned, in the west, was also greatly diminished in consequence of the movements of the Slavs and Bulgarians from the north and north-east, and of the Saracen advance from the southeast. The Slavs had forced a wedge running completely through the interior of the Balkan peninsula, and occupied almost the whole of the Peloponnesus; while the Bulgarians were settled in the regions we know as Walachia and Bulgaria. In Asia the Mohamadans had broken the border of Asia Minor, and in the last quarter of the eighth century acquired Cilicia. They had also possessed themselves of a large part of Armenia, but the Empire was able to make good some of the loss on the coast-line. It was in order to maintain an adequate system of defense that the Emperors gradually placed the civil and military authority in the same hands by the formation of themes, many of which will be found indicated in the accompanying map; they were not, however, established in all districts until later. 3· In the north of Europe the three Scandinavian kingdoms appear substantially as they have continued ever since; but it is to be observed (a) that the south-western corner of Sweden was always an integral part of Denmark down to the seventeenth century, (b) that Sweden did not yet extend further north than Upland and Westmanland, and (c) that the lands further north and those in the interior running southward along all the west side of Lake Vaenir were in the hands of Finnish tribes. Our map does not extend further north than the latitude of Trondhjem, but the Norwegians possessed the sea-board as far as Moldfjord. 4· From the Norwegian coast-lands eastward, the whole of the northern tracts of Europe were inhabited by Finnish (or Tchudish) races. On the Baltic coast (Livonia and Courland) were Lithuanians, who were surrounded on east, south, and west by various Slavonian tribes, ranging from Lake Ilmen and the upper waters of the Volga as far west as the Elbe and Saale. Southward of the latter were the Avars, whose power was overthrown by CHARLES THE GREAT; next them, beyond the Carpathians, but perhaps separated by various Slavonic tribes, was the great kingdom of the Khazars, from the south-west of which, in the former half of the ninth century, the Magyars issued to occupy first the territory west of the Dnieper and then the lands of the Avars; and finally, beyond the lower reaches of the Volga, were the Patzinaks (Petchinegs ). 5· In Asia and Northern Africa the Caliphate of the Omayads passed in 750 into the hands of the Abbasids; but five or six years later a grandson of the last Omayad Caliph succeeded in obtaining recognition in Spain, which thenceforward remained detached from the Eastern Caliphate, though the rulers of Mohamadan Spain did not adopt the title of Caliph until 929. The north coast of Africa also tended more and more towards an independent position: Morocco, indeed, was completely severed from the Caliphate under the schismatic (Sht’ite) Idrisids; and the Aghlabids in Tunis and Tripoli, while nominally subject to the Abbasid dynasty, practically exercised sovereign power. 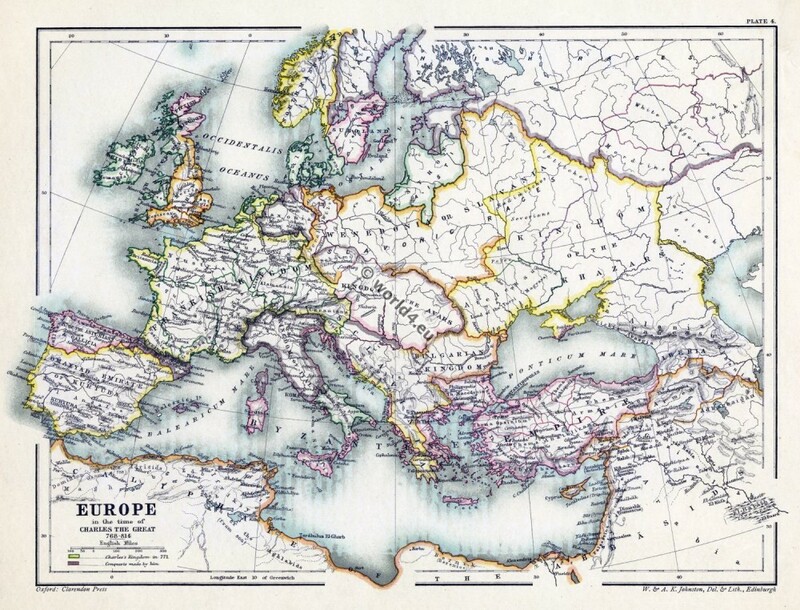 From the book: Historical atlas of modern Europe from the decline of the Roman empire: comprising also maps of parts of Asia and of the New world connected with European. Author: Poole, Reginald Lane. Publisher: Oxford: Clarendon Press; London; New York: H. Frowde.